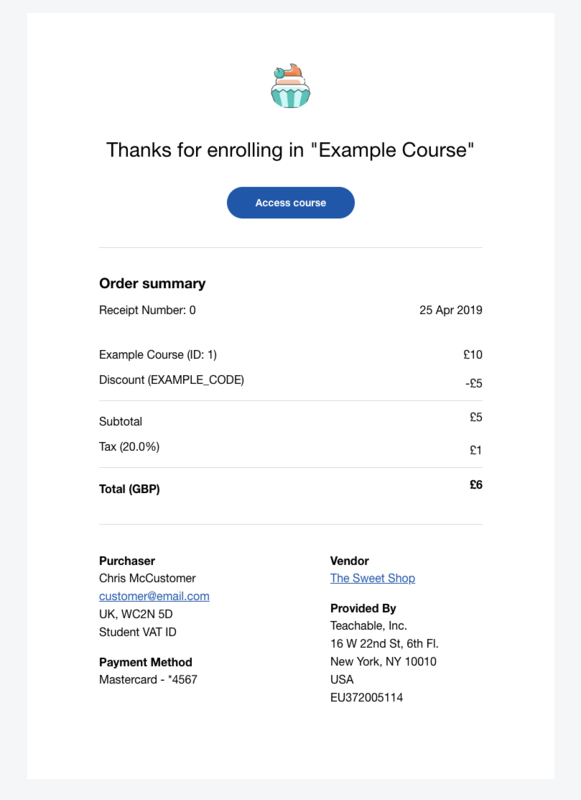 To help you in situations where you may be required to submit the EU’s value-added tax (VAT), we’re introducing a new email template for the receipts your students receive upon purchasing a course. NOTE: At this time, the new Receipt email template is only available for modification in the Template Editor (available on the Basic plan and up). On May 2nd, the new Receipt email template will replace the New Enrollment email template and the New Enrollment email template will no longer be sent to your students. The information that appears on the receipt depends on your payment gateway and whether or not you have BackOffice enabled. If you’re on the Basic plan and up, then you can make additional modifications to the new student receipt template in the Emails > Template Editor > Students > Receipt section of your school admin. Since we released certificates of completion last June, we've seen school owners on the Professional plan and higher create thousands of certificates for their students. In an effort to make creating new certificates as easy as possible, we've revamped our certificate editor and made it better than ever. Now, whenever you make a change to anything on your certificate, you'll see a live, real-time preview of your certificate on the same screen. This will be the case whether you're using a default certificate template, or a custom certificate built with Liquid/HTML. For more information on the certificates editor, take a look at this Knowledge Base article. 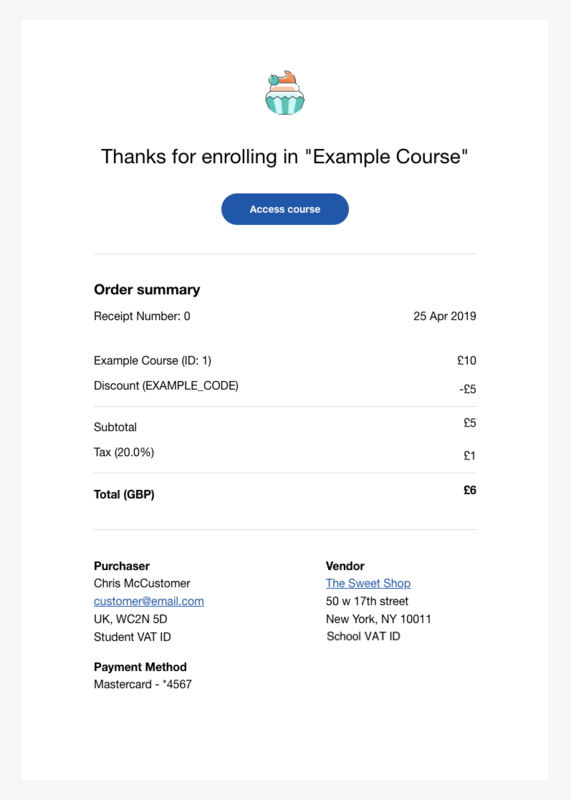 In an effort to address the EU's value-added tax (VAT) requirements, we'll soon be making changes to the receipts your students receive upon purchase. 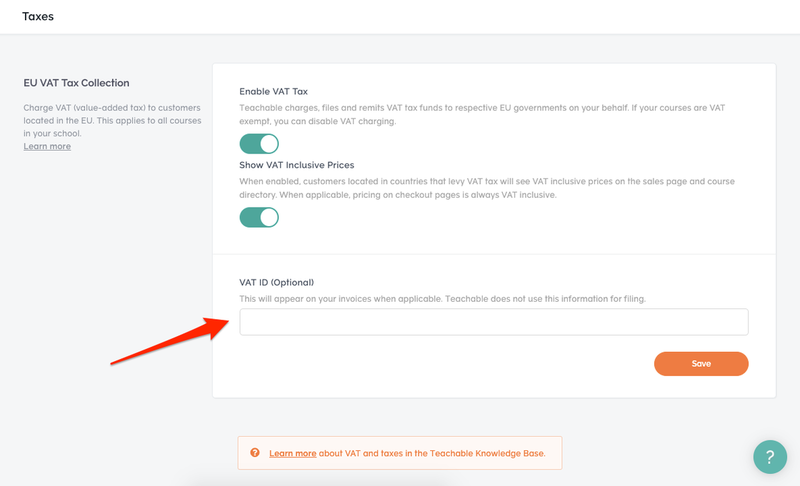 In anticipation of these changes, you now have the option of inputting your VAT ID in the Settings > Taxes section of your school admin. Initial purchase receipts can be modified in the Emails > Template Editor > Students > New Enrollment section of your school admin. Recently, email providers (e.g. Microsoft, Gmail, et al) have made efforts to reduce spam emails. Unfortunately, these changes resulted in some Teachable-sent emails being marked as spam. To improve email deliverability, we've changed the from_email (i.e. the email address from which your emails are sent) for custom emails to [email protected]. This will ensure that email providers are marking your emails as being sent from a trusted source. The name and look of your emails in the recipients inbox will not change. Any email template customizations of branding you've set up will stay the same. Additionally, we've added a reply-to field that will list the email address specified in your school's General Settings. This will allow your student to directly reply to the emails you've sent. With these changes we hope to see email deliverability rates improve across the platform. We know that engaging with your students is important, so we want to make sure that your messages are getting across. For more information, check out our Knowledge Base. As a school owner, it can be difficult to determine if your students are fully comprehending and engaging with course content. While you can use progress reports to view video engagement, quiz scores, and lecture progress, until now, there hasn’t been a way for you to ensure that students achieve certain milestones before progressing through a course. For example, you may want your students to pass a final quiz before allowing them to move on to the next lecture. Or, you may want your students to view lectures only in sequential order. Students must watch each lecture video before progressing to the next lecture. Student must complete lectures in sequential order (as they appear in the course curriculum). Student must achieve a passing grade on a quiz within a set number of retakes. To enable Course Compliance settings, head to the Information > Course Compliance section of your course admin area. Then, select any of the following settings: Enforce Video Watching, Enforce Lecture Completion, and Enforce Graded Quiz Completion. Find out more about Course Compliance in our Knowledge Base and blog! From there, you'll be able to access your Thank You Page, Sales Page, and Checkout Page editors, so you can customize them as you see fit. Previously, school owners were required to set up custom payment gateways in order to receive faster payouts. Alternatively, if you wanted Teachable to take care of some administrative tasks for you, you'd have to setup the Monthly Payment Gateway. Unfortunately, there was no way to have the benefits of both gateways. 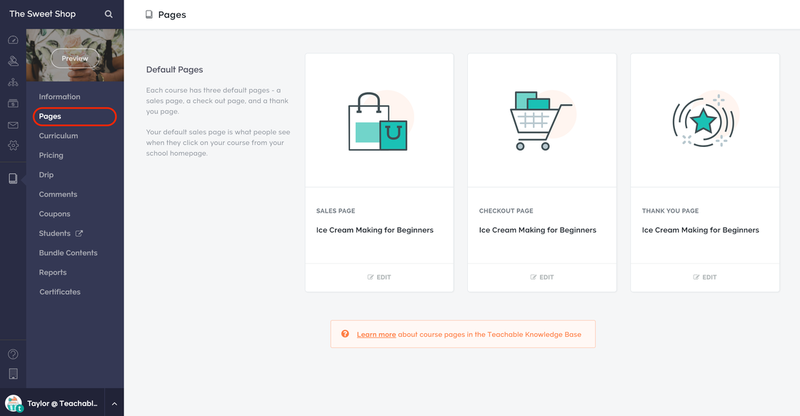 That's why we're so excited to announce Teachable Payments and BackOffice. Teachable Payments is our new native payment gateway for US & Canada schools that allow you to decide when to get your payouts for credit card transactions—be it daily, weekly, or monthly. We also wanted to make selling your course as easy as we could—that's where BackOffice comes in. Once enabled, BackOffice takes care of some of the logistical pains of selling your course for a 2% fee per transaction. In the future, we're hoping to continually expand upon our suite of BackOffice services, so you can worry on the most important thing: creating your course. Find out more about Teachable Payments and BackOffice on our Knowledge Base. We're excited to announce that we've made some big improvements to our transaction reports! 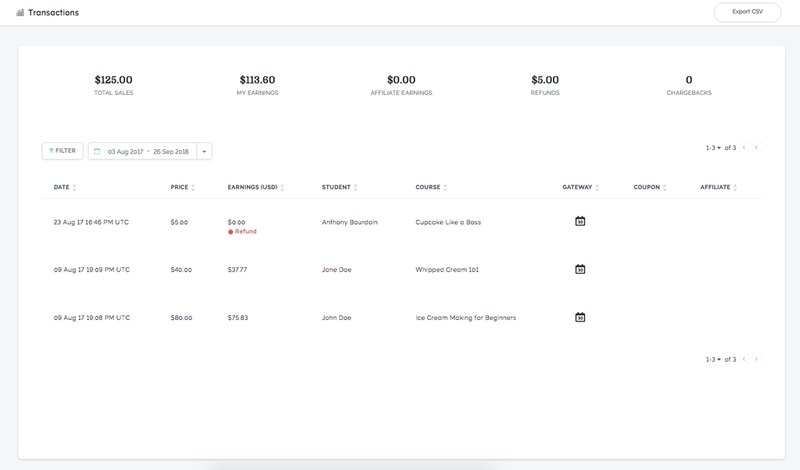 Now, an overview of your transaction history will display more information about total sales, earnings, affiliate earnings, refunds, and the number of chargebacks in the Sales > Transaction section of your school admin. We've also added some additional filters, including a date range filter so that you can better sort your school's transaction data. These improvements to transaction reports will help school owners better track, monitor and account for their school's transactions. In an effort to be more clear with our naming conventions, what was was before called the Teachable Payment Gateway will now be known as the Monthly Payment Gateway. There will be no change to the functionality of the gateway, and schools using the Monthly Payment Gateway will still be paid out every 30 days on the first of the month. We’re excited to announce that earnings statements are now available for schools on all plans! Now, Teachable will report earnings paid out after November 2017 in the Sales > Statements section of your school. Earnings statements will help school owners keep better track of their payouts by providing more details about their earnings, including payouts statuses, author and affiliate earnings, etc. This makes it easier to determine how much your school will be paid out and when! Surely Teachable will start publishing changelogs very soon.